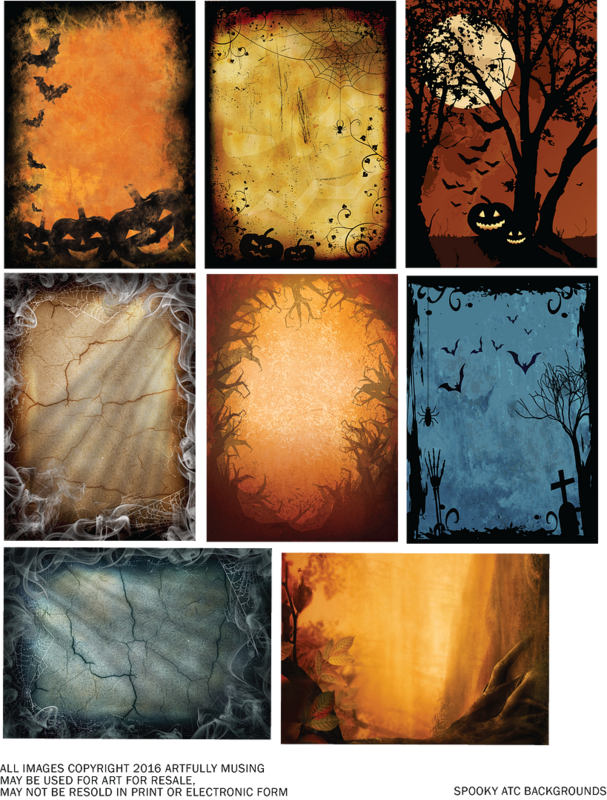 My treat for you on this spookalicious day is the Halloween Spooky Background collage sheet pictured above. The backgrounds are ATC sized but would also work for cards and other collage projects. Feel free to download it and use it in your artwork. I thought I would take a short break from Halloween projects with this moon themed 3D grandfather clock. To me, clocks lend themselves to all kinds of creative possibilities and themes, which caused me much angst in trying to decide which way to go before I settled on the moon theme. No doubt you'll see me do something else with this clock in the future. The clock is made from a chipboard kit making assembly easy. 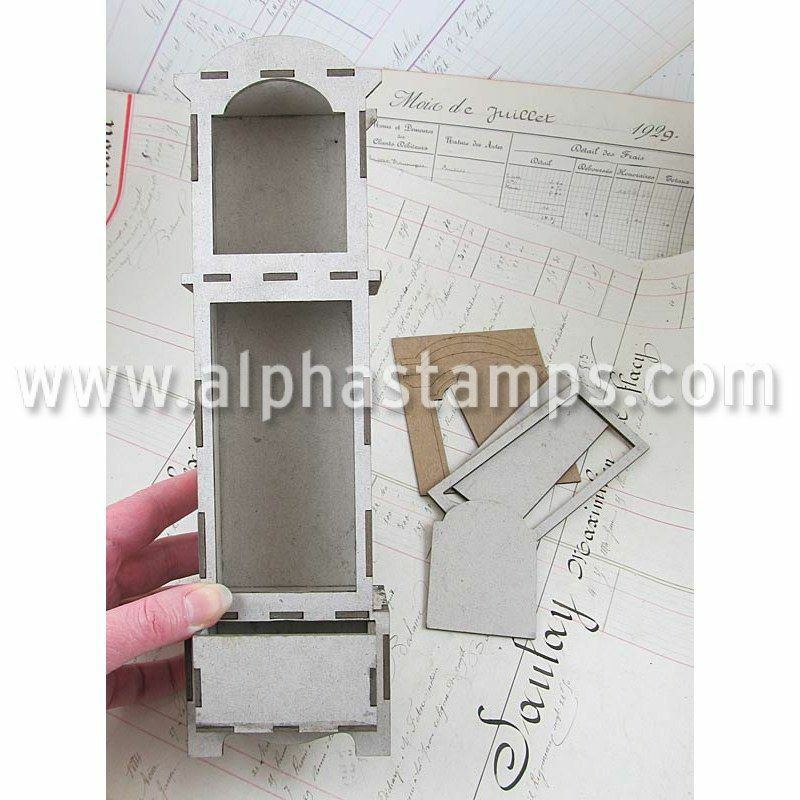 In addition to the large clock kit I used in this project, Alpha Stamps is also carrying a smaller version that is 1:12 scale in size. 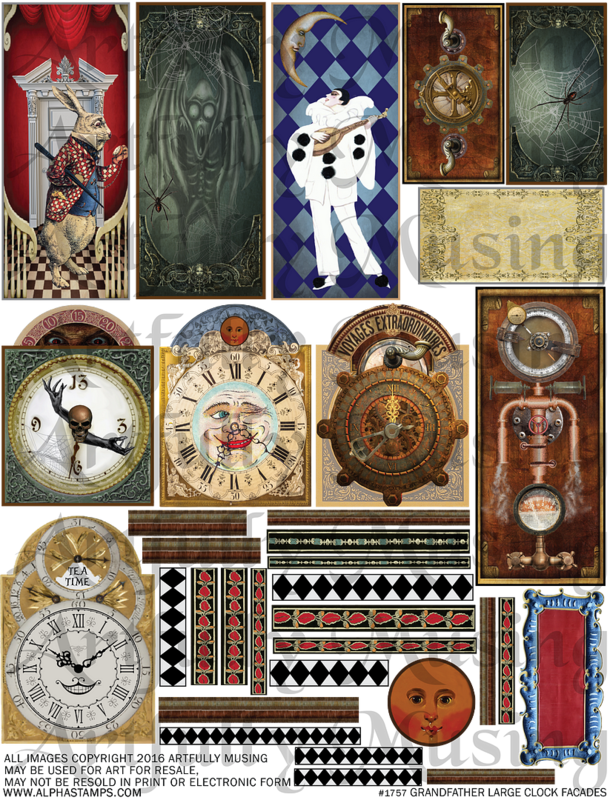 To complement the clock kit, I’ve created a new Large Grandfather Clock Facades Collage Sheet. 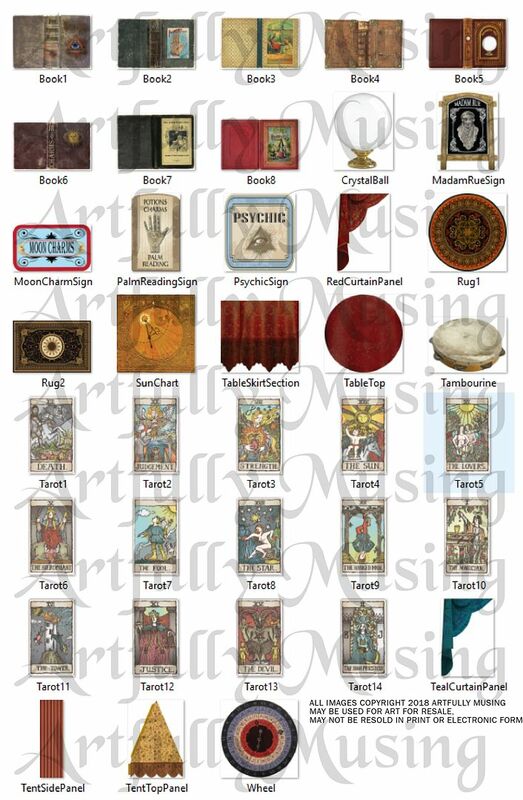 The moon themed images I used from the sheet are just one of four different themes to choose from which also include, Alice in Wonderland, Steampunk, and Halloween. 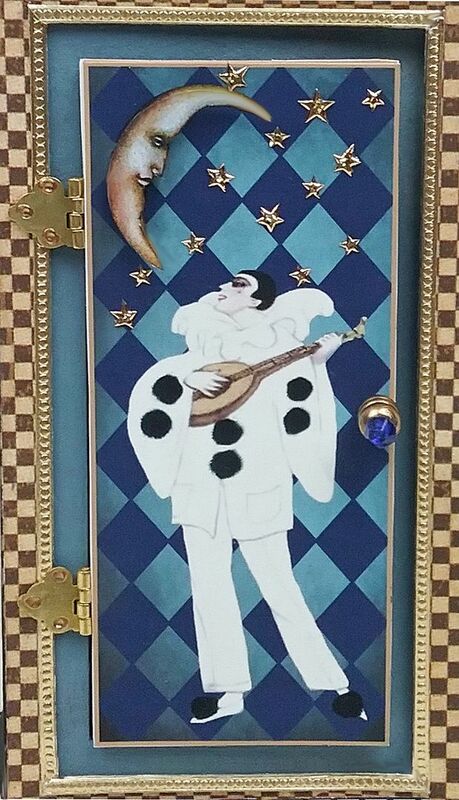 To add more whimsy to the clock, I created a new collage sheet of costumed characters dressed as Harlequin, Columbine, and Pierrot. 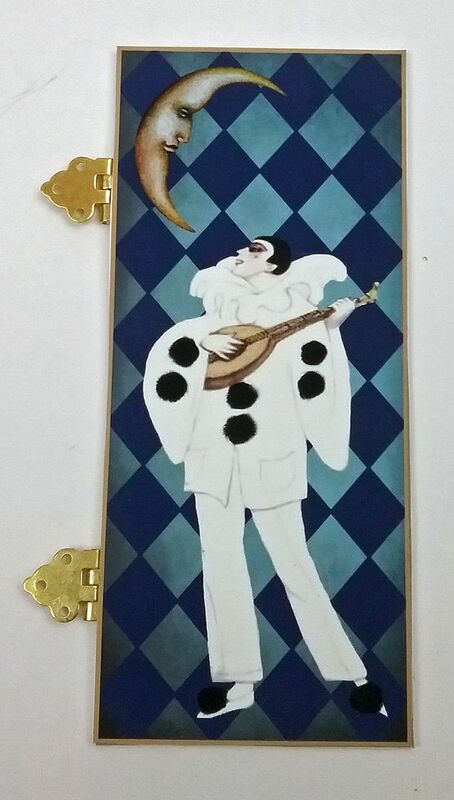 You’ll notice that Pierrot appears on the front of the clock serenading the moon. This sheet contains four different themed facades, sized to fit the large 3D grandfather clock. 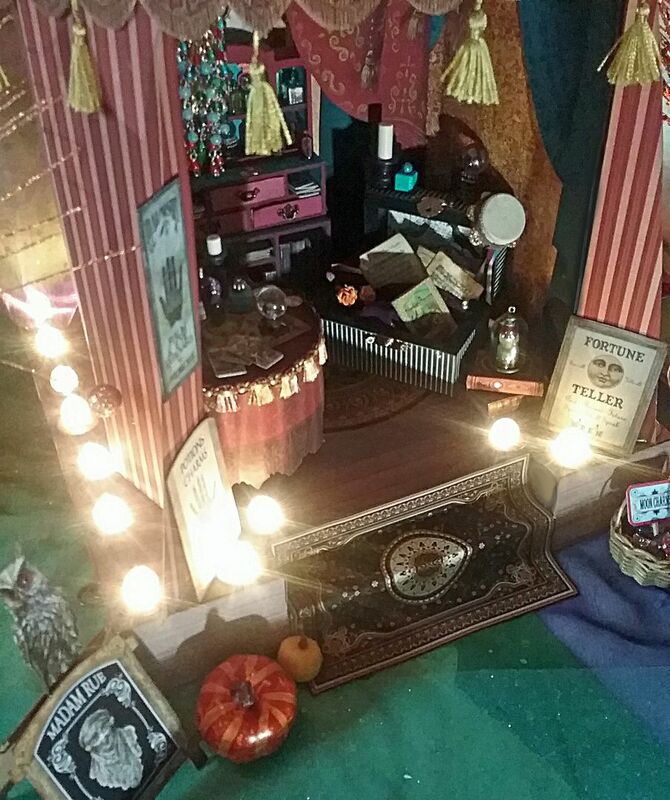 The themes are Alice in Wonderland, The Moon, Halloween, and Steampunk. There are clock face images, front panel images, and decorative borders for each of the themes. This sheet includes 9 men, women and a cat dressed in Harlequin, Columbine, and Pierrot costumes. I started by assembling the clock cabinet. 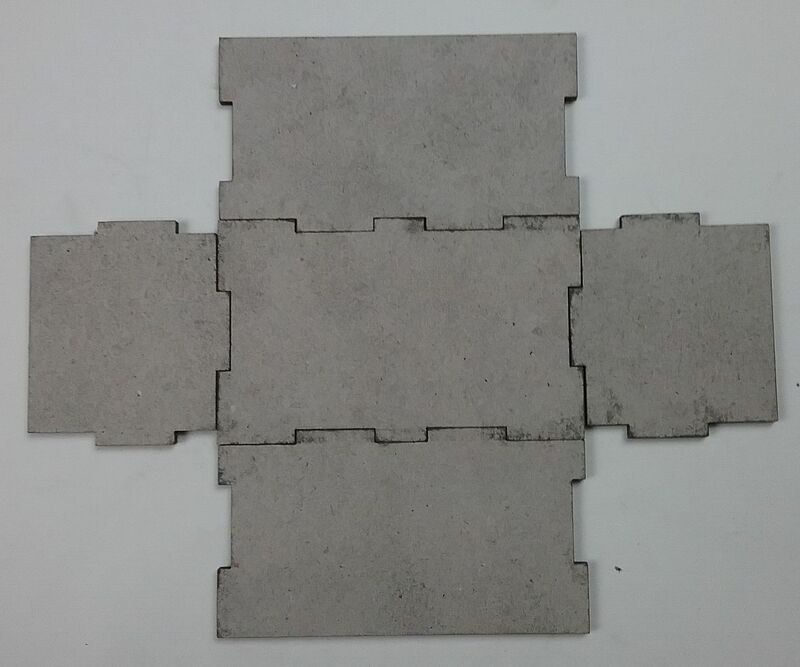 Below are pictures to help you see how the pieces fit together. 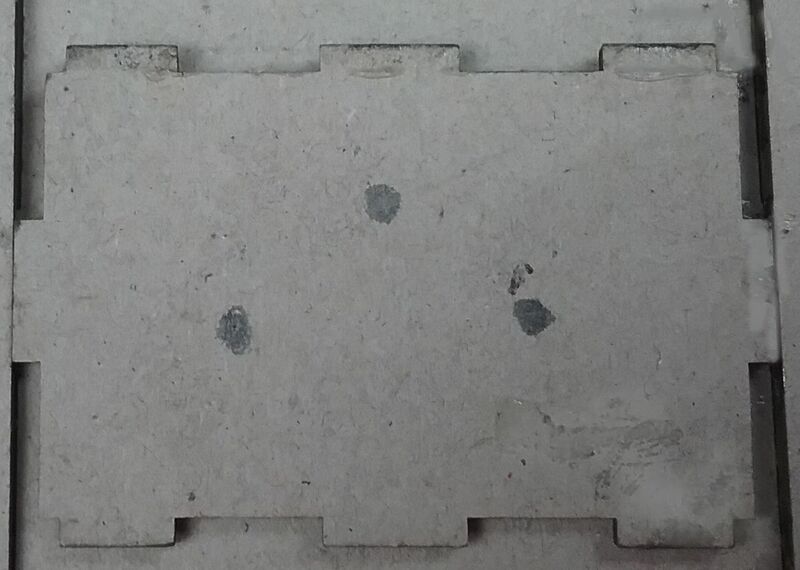 Before assembling the cabinet, I marked and punched holes for the clock weights and pendulum. Next, I assembled the cabinet and painted it and the clock front black. I then papered the inside of the clock cabinet and re-punched the holes. For the inner workings of the middle section of the cabinet, I started by gluing chimes slightly popped up from the back of the cabinet. 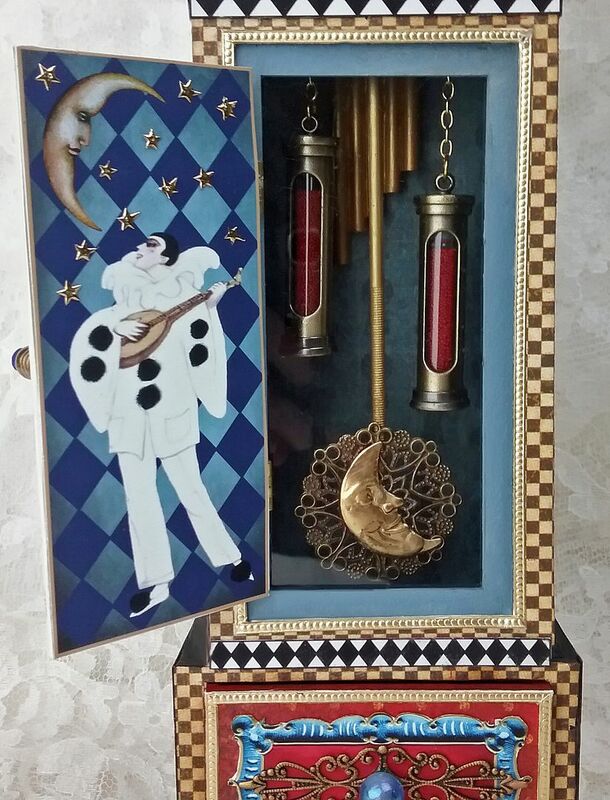 The chimes are made from Mini Silver Wind Chimes that are glued together and painted gold. 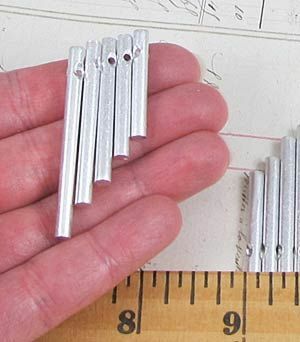 The weights are Mini Glass Tube Pendants filled with microbeads. 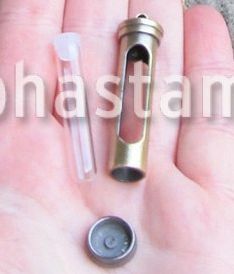 You can pull off the bottom of the tube pendants to access the glass tube inside. I hung the pendant weights on chains and then used a jump ring on the other side of the chipboard divider to keep the chain in place. To make sure that the opening in the pendant weight faced forward (so you could see the beads inside) I added glue to the jump ring which keeps the chain from twisting. 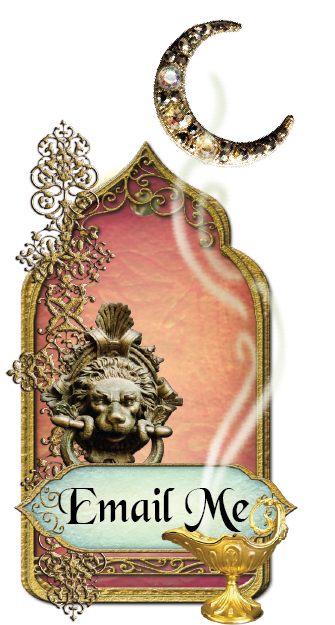 The pendulum is a metal rod from my stash, filigree and a brass moon. I inserted the rod through the hole and glued it in place. For extra support, I slid a rondelle onto the rod and glued it in place. If you choose to hinge the clock face to the clock cabinet, you will want to hide the area with the jump rings and rod. An option to cover that area would be to use the drawer of a matchbox turned upside down. The compartment is deep so there is plenty of room for the matchbox drawer. In the case of my moon clock, the clock face is glued in place so there was no need to hide the jump ring and rod or to worry about the ugly looking glue. I started by papering the front side of the clock front with tan and brown checkered paper from my stash (the back side is painted black). With this kit, you have the option of having the clock face fixed in place or you can hinge it to the clock front, which then gives you access to the clock face compartment. If you were going with a Steampunk theme it would be cool for this section to open and to see the inner workings of the clock. For my moon clock, I chose to glue the clock face and frame to the clock front. Between the image of the clock face (which comes from the Large Grandfather Clock Façade collage sheet) and the clock face frame (painted red), I glued a piece of clear plastic to serve as faux glass. I used a raw brass box foot and a bead as a faux pull. 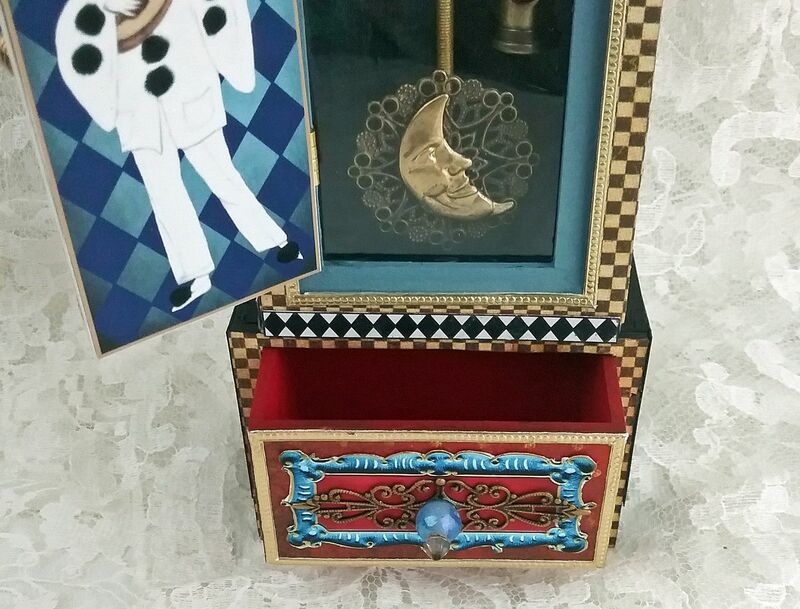 The kit comes with two chipboard trim pieces to dress up the top of the clock. I papered one with Double Dot Vintage Wild Berry scrapbook paper and painted the other blue. Just as with the clock face area you have an option as to how you want to view the middle of the clock case. 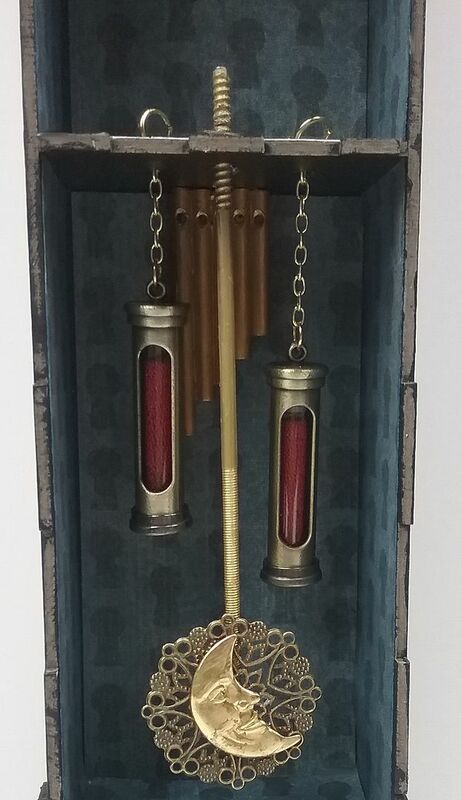 You could just glue the frame in place and leave it open to view the weights, pendulum, and chimes or you could add a hinged panel that opens to view the area. 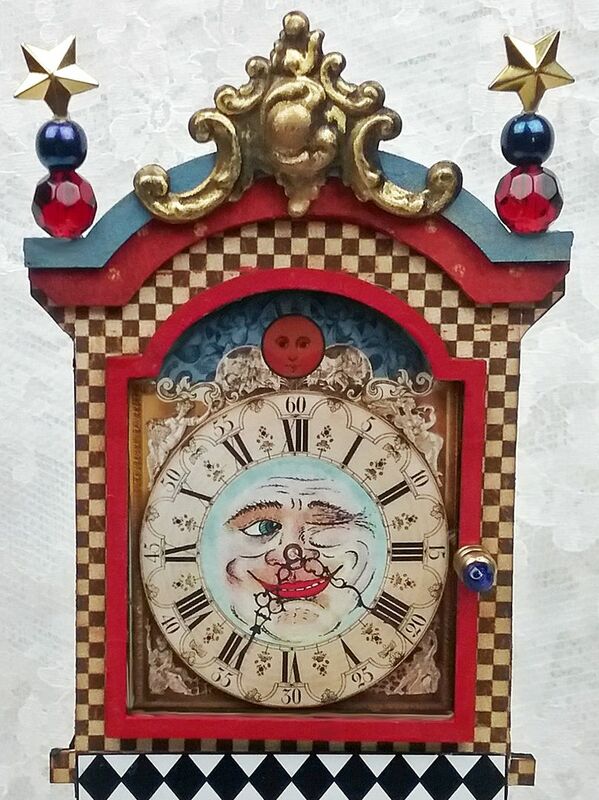 For my moon clock, I decided to add a hinged door using an image from the Large Grandfather Clock Façade Collage Sheet. 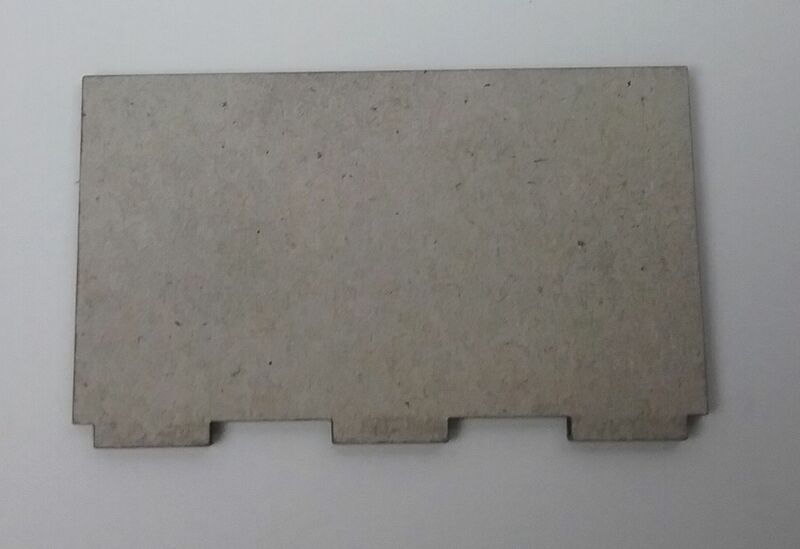 I cut a thin piece of chipboard and glued the image to one side. 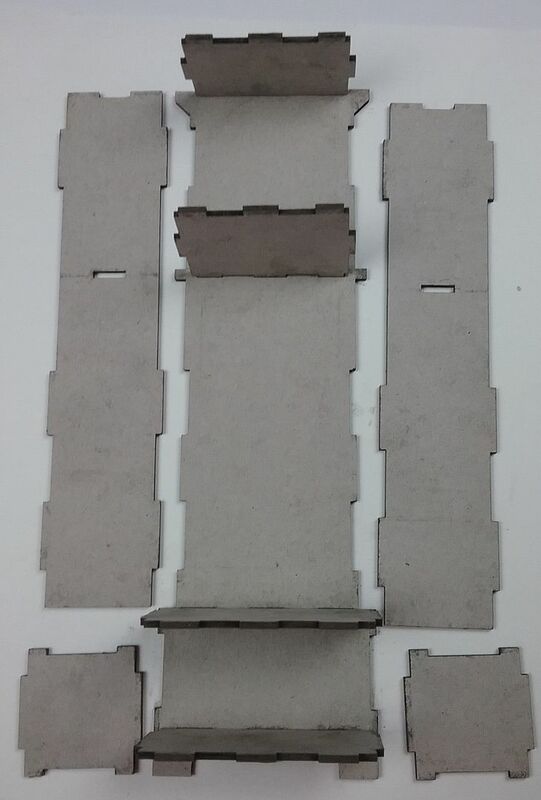 To the other side of the chipboard, I glued small hinges. Next, I glued a second version of the image on the other side of the chipboard thereby covering the hinges. The kit includes a frame for the midsection of the clock front. I painted this frame blue and then glued a piece of clear plastic behind the frame to serve as faux glass. Next, I glued the frame in place. The frame fits flush with the opening. I trimmed the frame area with gold tiny dot Dresden borders. Finally, I glued the hinges to the front of the clock over the opening in the frame. I used a raw brass box foot and a bead as the door handle. Next, I glued the front of the clock to the clock case. If you choose to use a panel for the bottom section you should glue it in place before gluing the front of the clock to the clock case. For the bottom of the clock, you can either use the panel or drawer from the clock kit. 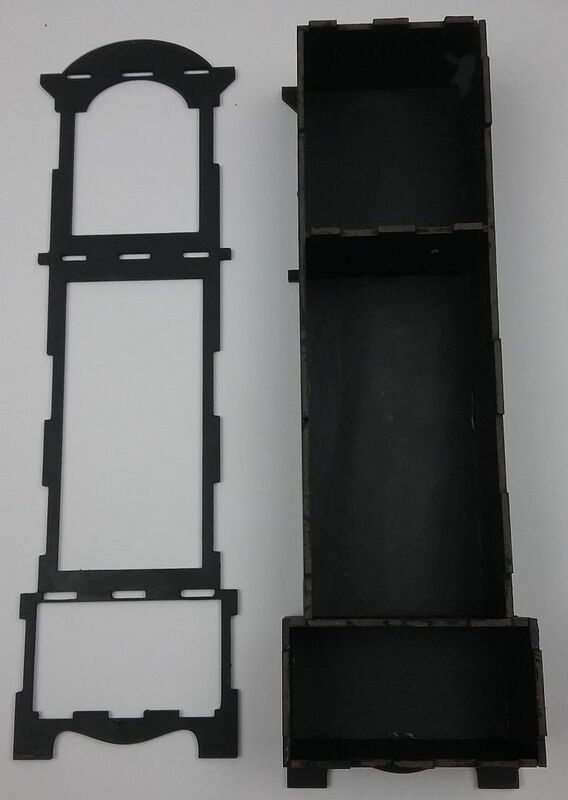 Below you can see a picture of how the drawer pieces fit together. 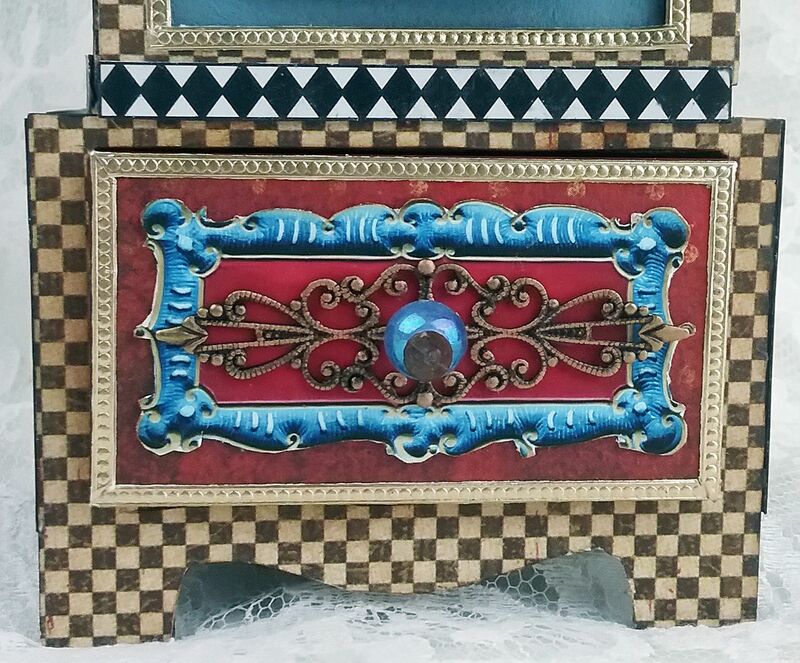 I painted the drawer red, then papered the front of the drawer with Double Dot Vintage Wild Berry scrapbook paper. I didn't paper the sides or bottom of the drawer as I didn't want to create too much bulk that would get in the way sliding the drawer in and out. I added a panel from the new collage sheet plus a piece of filigree and trimmed the front with gold tiny dot Dresden borders. I used beads for the drawer pull. 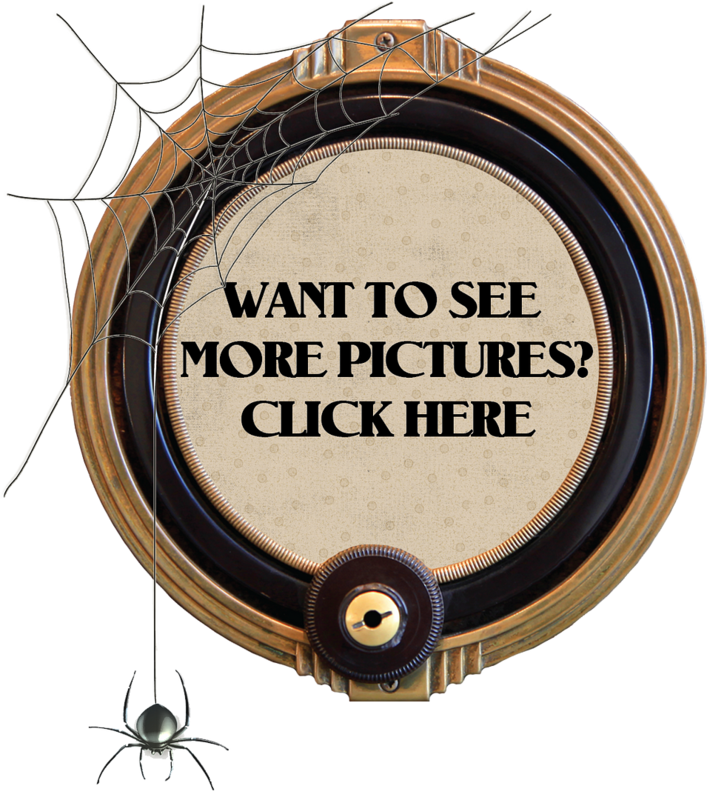 I papered the sides and back with Halloween in Wonderland – Wonderland Classifieds scrapbook paper. By waiting to paper the sides and back until after attaching the clock front to the clock case, it allowed me to cover up the tongue and groove areas where the two pieces fit together. Next, I added black and white diamond trim from the new collage sheet to the front, sides, and back. 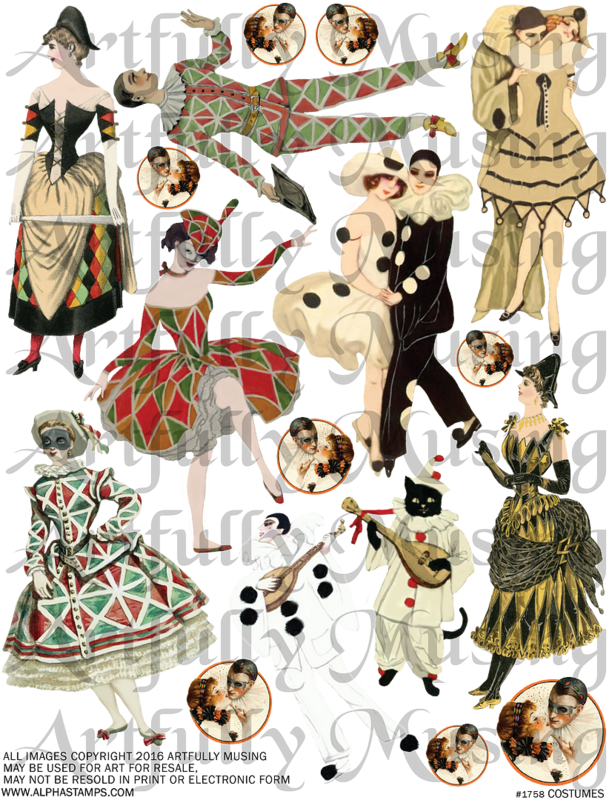 I added Dresden moons and figures from the Costumes collage sheet. 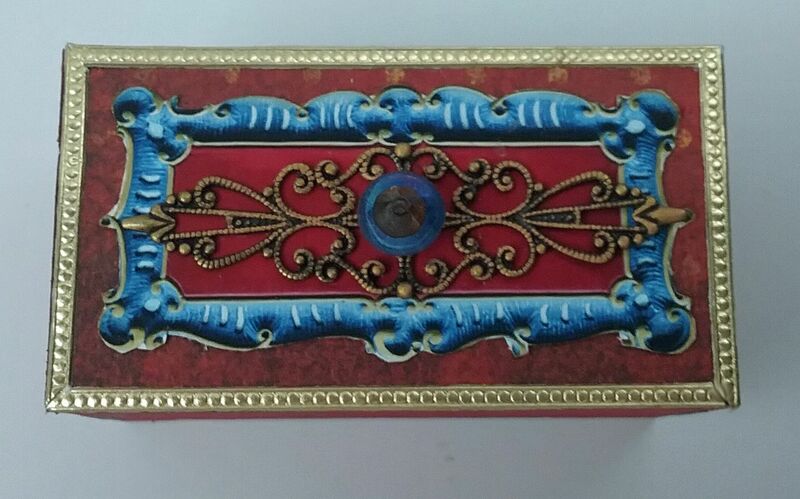 To the top center of the clock, I added a decorative brass piece from my stash. To serve as finials I stacked beads and gold star studs. Click here to jump to the complete supply list. 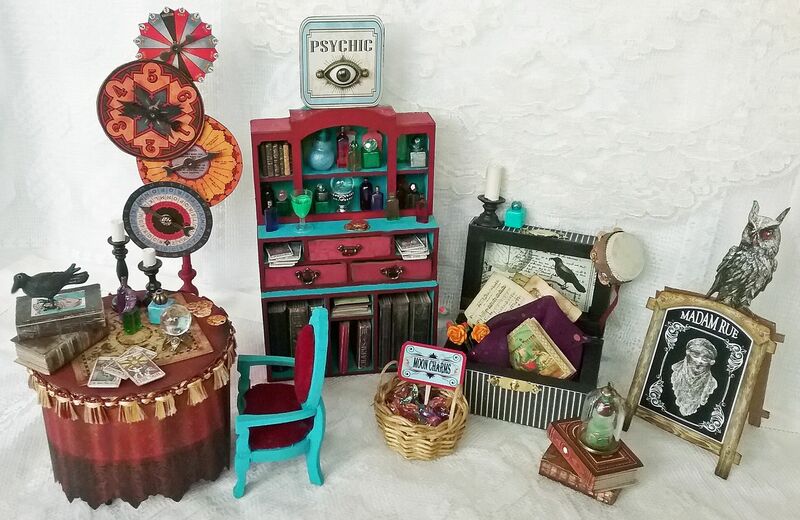 Welcome to the mystical world of Madam Rue. She has the gift of sight which can reveal your future and explain your past. Only she can lift the veil of mystery and connect to the regions beyond. If revelation is not what you seek, but instead a charm or potion, you have come to the right place. Is it love, fame, fortune or perhaps release from a curse? Or maybe it was the sound of her tambourine and her melodious voice that drew you here. Be not afraid, step inside, your destiny awaits. 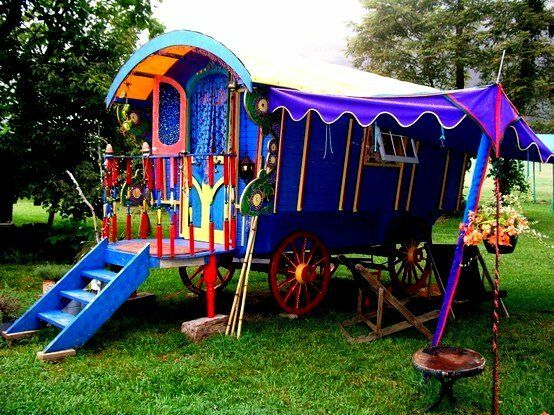 Here comes another Halloween project, although I’m thinking gypsies are never out of season. For those who have built or are building the Halloween Carnival, this is a piece you might want to add to your display. 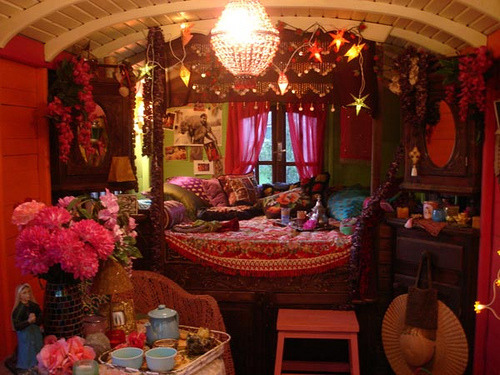 My choice of a jeweled toned color palette comes from looking at pictures of gypsy caravans where I noticed bright colors, fabrics, beading, fringe and bling. What did I love the most about this project? I think the mini globe lighting is right at the top. I wish I could go back to some of my older pieces and use the lighting. It would also look cool with the Mad Scientist Lab from earlier in the summer. I also love the furniture which is made from either a kit or from unfinished wood items. My particular favorite is the 3 Panel Hutch sitting on top of a Library Table. The furniture pieces could easily work standalone or as part of another one of your projects. 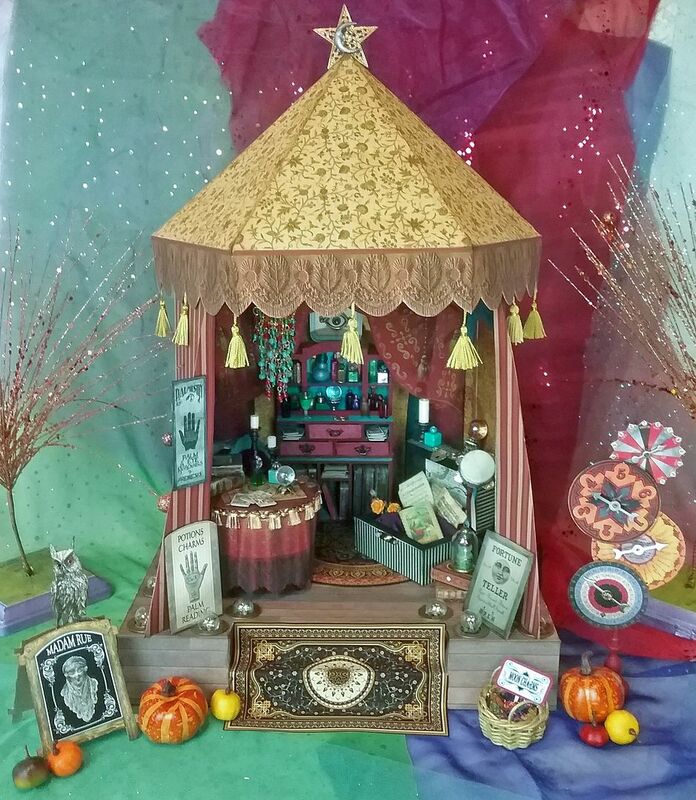 Don’t sweat the details as there is a video tutorial where I’ll walk you through creating Madam Rue’s tent. I’ve cooked up some new gypsy fortune teller themed images for this project. I also used some of my Old Books & Papers Digital Image Set. This sheet is a collection of mystical items. 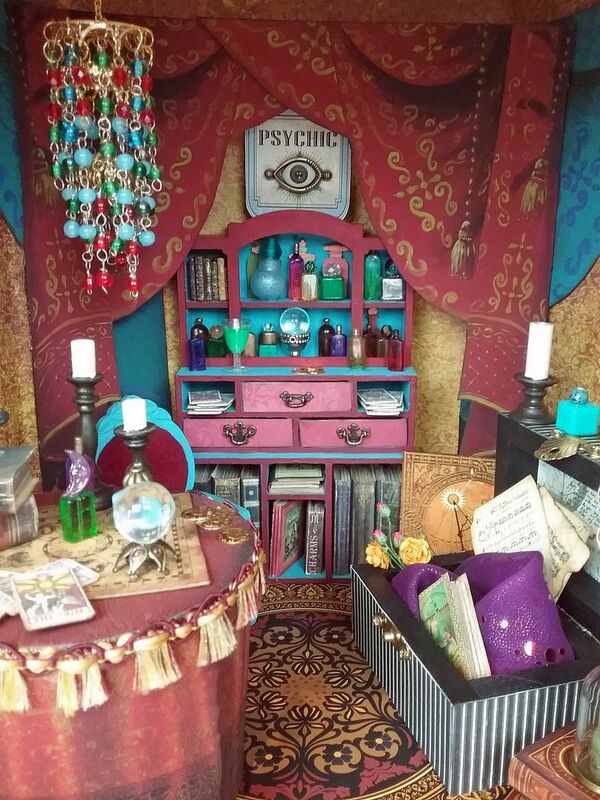 There are books on palm ready, fortune telling, crystal ball reading and more. There are various business signs, tarot cards and other odds and end that a seer into the beyond might need. 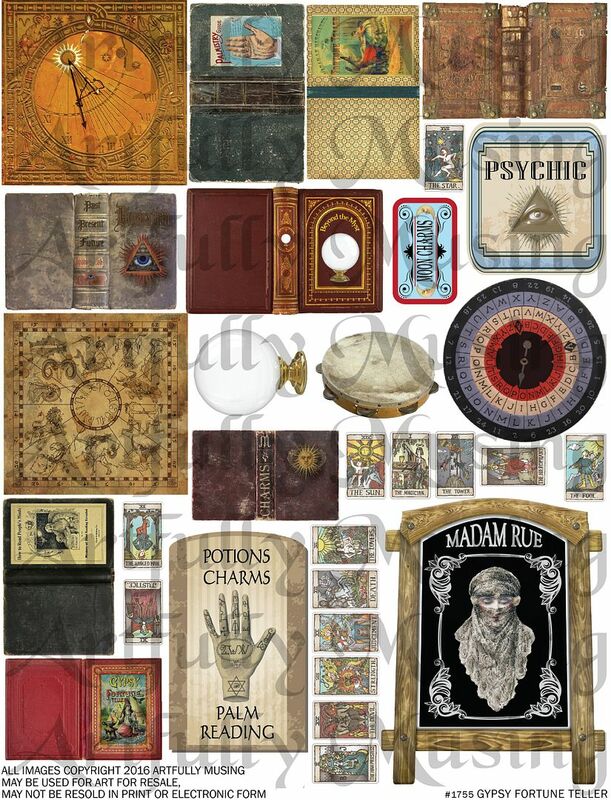 This set is a collection of mystical items that a seer into the beyond might need. 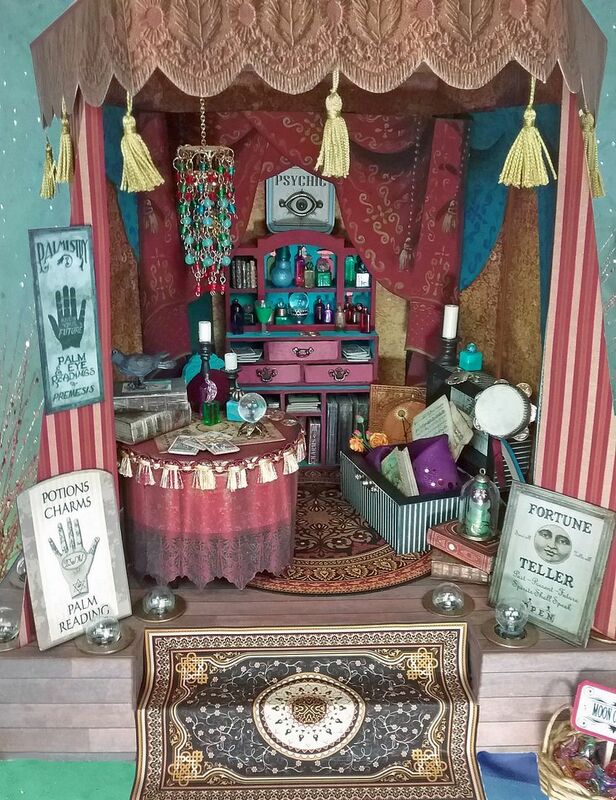 In addition, the set contains images that you can use to create and outfit a gypsy tent. 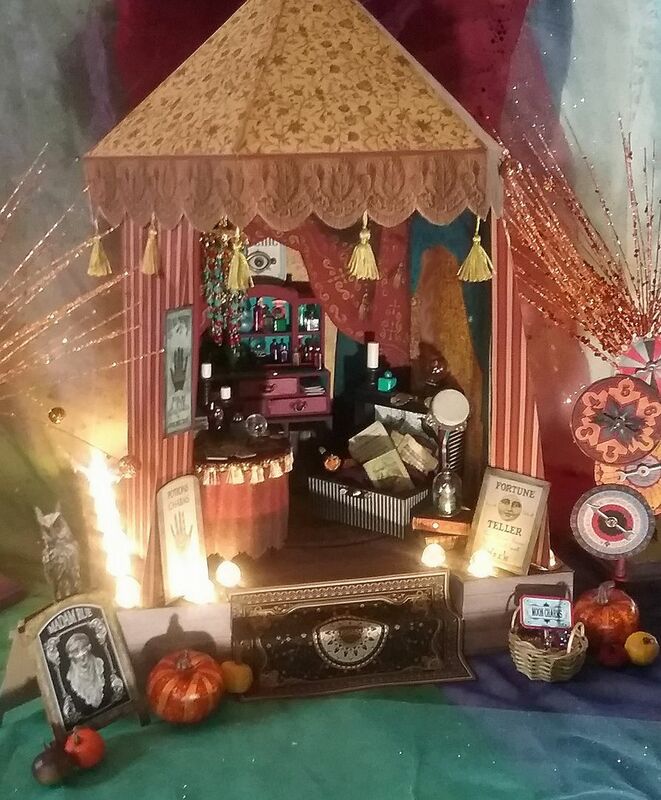 All of the images in the Gypsy Fortune Teller Collage Sheet are included plus a tent top panel, tent side panel, images to decorate a table, curtains, and rugs for a total of 38 images. 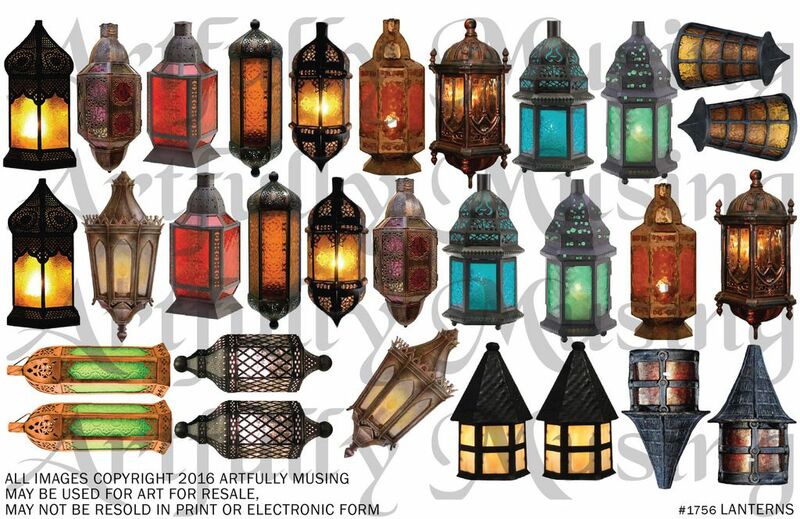 This collage sheet contains 15 different lanterns with two of each style of lantern for a total of 30 images.